I attended the Nestlé shareholder meeting on 10 April 2014 with a colleague from the Geneva Infant Feeding Association (GIFA), a partner in the International Baby Food Action Network (IBFAN). We both raised concerns about Nestlé’s marketing of breastmilk substitutes – and exposed how Nestlé endangers health and misleads shareholders. There were over 2,700 shareholders attending the meeting, representing 66% of the shares, with more watching the live webcast. We will continue to remind them that Nestlé needs to change its ways. Nestlé’s claims in reports to shareholders that it abides by the International Code of Marketing of Breastmilk Substitutes, but staff are called on to abide by Nestlé’s own weaker policies, not the Code. The Nestlé Nutrition Chief Executive, Mr Luis Cantarell, admitted to shareholders that 90% of violations of the Code reported by IBFAN are allowed by Nestlé’s own policies. Mr Brabeck told shareholders that ‘responsibility of applying the Code is up to each individual government’, ignoring the fact that companies are also called on to ensure their practices at every level conforms with the provisions of the Code ‘independently of any other measures’. Mr Brabeck implied that only IBFAN has concerns about Nestlé practices, ignoring concerns raised by others, including Save the Children, UNICEF, FTSE4Good and the Access to Nutrition Index (ATNI). 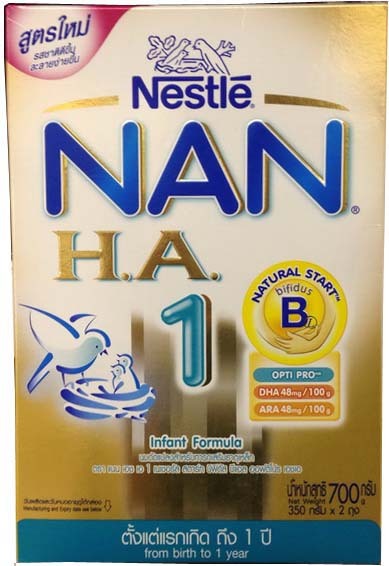 Nestlé claims to support breastfeeding as the best start in life, but undermines it by promoting its formula with claims such as it is the ‘natural start’, ‘gentle start’ and ‘protects’ babies. It is staggering the degree of contempt that Mr Brabeck and his infant nutrition team have for shareholders and the truth. Nestlé boasts of transparency, but omits key information from reports and misrepresents the company’s responsibilities and practices. I called on shareholders to investigate this issue for themselves and hope they will look beyond their dividends and do so. Full details, transcripts and links are given below. Camille Selleger of the Geneva Infant Feeding Association (GIFA) raised concerns about Nestlé’s double standards and abuse of human rights. Nestlé draws a distinction between what it has defined as ‘high risk’ and ‘low risk’ countries in its marketing policies. It advertises infant formula openly in ‘low risk’ countries (unless prevented by law), but uses more subtle strategies in most ‘high risk’ countries. What we are discussing here, what you’re challenging here, is the application of the WHO Code. What does the WHO say? That responsibility of applying the Code is up to each individual government and Switzerland has regulated the application of this Code. And, we respect Switzerland’s application of this Code 100%. What you said as an organisation in the past is that in the countries where the government has not applied the Code locally we must respect the Code and we made that commitment. So saying that we don’t respect the rights of the child here in Switzerland, that is cynical. Independently of any other measures taken for implementation of this Code, manufacturers and distributors of products within the scope of this Code should regard themselves as responsible for monitoring their marketing practices according to the principles and aim of this Code, and for taking steps to ensure that their conduct at every level conforms to them. Mr Brabeck simply ignores this in his comments to shareholders and in his company’s policies and management systems. Mr Brabeck misled shareholders in suggesting IBFAN had changed its position. The Code was adopted under World Health Assembly (WHA) Resolution 34.22 which states the Code is a ‘minimum requirement’ to be implemented in ‘entirety’ in ‘all countries’. It has always been the position of WHA and IBFAN that companies should abide by the Code in all countries, independently of other measures. Suggesting that IBFAN is calling only now for Nestlé to abide by the Code in Switzerland is simply false. I spoke from the floor to raise concerns about the misleading nature of Nestlé’s management reports. The latest global monitoring report, Breaking the Rules, Stretching the Rules 2014 [showing report cover], documents violations of the Code and Resolutions by 27 companies. Once again, Nestlé stands out for the scale of its violations of the Code and Resolutions. IBFAN is not alone in calling for Nestlé to change. For example, Save the Children and UNICEF have also said Nestlé violates the Code. You talked about Breaking the Rules. We are currently analysing this report and we will be posting all answers to these questions on our website. And I can say that over 90% of your allegations they comply with our policies as the Chairman has already explained. This confirms that Nestlé’s policies are weaker than the Code and Resolutions. In fact, Nestlé weakened its policies further in 2011 prior to being included in the FTSE4Good ethical investment index (demonstrating how this initiative drives down standards – see below). Baby Milk Action has put a four-point plan to Nestlé for saving infant lives and ultimately ending the boycott. The first point is to accept the validity of the Code and Resolutions. Nestlé refuses to do so. See the four-point plan. Nestlé posted its management reports on its website prior to the AGM. 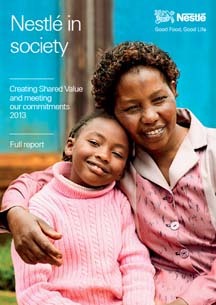 This included the report Nestlé in Society: Creating Shared Value and Meeting our Commitments (shown left). This suggests there were just 27 contraventions of the International Code of Marketing of Breastmilk Substitutes in 2013. This is demonstrably false – Nestlé systematically violates these measures. Concerns were raised in 2013 not only by Baby Milk Action and the International Baby Food Action Network (IBFAN), but organisations such as Save the Children. The lack of transparency is even worse than this, however. Shareholders concerned about the lack of transparency can check the ATNI website. My question this year then is why won’t you listen to the Indian Government, Save the Children, ATNI, FTSE4Good and all the other bodies who are calling for Nestlé to change? Why won’t you bring Nestlé’s practices into full compliance with the International Code in all countries? Mr Brabeck did not answer this question at all, instead calling for IBFAN to ‘be a partner’ with Nestlé in promoting breastfeeding. It is not Nestlé’s role to promote breastfeeding, it is its role to market its products in line with the Code and Resolutions. As we expose in our Update 46 newsletter, Nestlé’s ‘First 1000 Days’ health education initiative has an underlying intention of boosting sales of infant formula and other products. And then, there is how we go about our business. We fundamentally believe that our activities should have a positive impact on society, every day, everywhere, that they should create shared value. To prosper, we have to take a long-term view, framed in a robust set of principles and values that are based on respect: respect for people and diversity, respect for the environment, and respect for the world we live in. Our approach is increasingly better understood and recognised externally. Nestlé is for instance included in the FTSE4Good Index, holds the number one spot in Oxfam’s Behind the Brands scorecard and is for the first time the leading food products company in the Dow Jones Sustainability Index. These are recognitions to be proud of, that motivate us to continue our efforts to be an exemplary corporate citizen. We will continue to measure and identify the ways we connect with society at large and be sensitive to what is expected from us. A slide showing the FTSE4Good, Oxfam and Dow Jones Sustainability Index logos appeared on screen. Mr Bulcke did not mention that FTSE wrote to him on 14 November 2011 about activities detected in India that could be regarded as promotional, including supporting conference attendance, activities which the Indian Government has said break its laws. FTSE4Good is an ethical investment index from the UK stock exchange listing company FTSE. It progressively weakened its breastmilk substitutes marketing criteria as no company was complying with the Code and Resolutions. It now looks to company policies as the benchmark, rather than the Code and Resolutions. Prior to being included in the FTSE4Good Index in March 2011, Nestlé weakened its own policies in July 2010. In the past Nestlé said it would not promote follow-on milks with the same branding as infant formula. In the new policies it dropped the restriction on common branding and allows itself to advertise milks for babies over one year old. 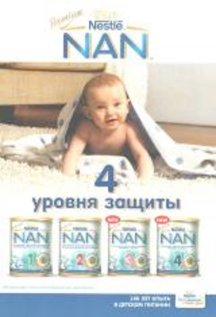 Nestlé uses this to justify advertising the third tin shown on the Armenian leaflet left – which serves to promote the full Nan range. So FTSE’s approach encourages companies to weaken their policies. The Oxfam Behind the Brands initiative looks to company policies rather than monitoring what companies actually do. Baby Milk Action warned Oxfam that this would be exploited by Nestlé and other companies that are expert at churning out reports and divert attention from company practices on the ground. So it has proved. While we were waiting for the AGM to begin, Nestlé showed advertisements for its products from around the world. I was interested to see that Matt Damon is now the face of Nespresso coffee alongside George Clooney. Mr Clooney was put on the spot at a press conference at the Venice Film Festival in 2007 over working with a company with a track record of abusing human rights. He responded, ‘I’m not going to apologize to you for trying to make a living every once in a while. I find that an irritating question.’ See press release George Clooney questioned over role in advertising ‘widely boycotted’ Nestlé. 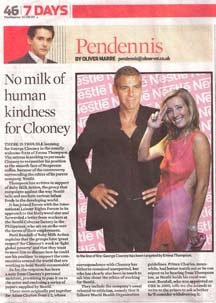 Actress and long-time Baby Milk Action supporter Emma Thompson subsequently raised concerns with Mr Clooney, but he only repeated Nestlé’s discredited claims. Why Nestlé has now recruited Matt Damon has more to do than being a famous name. Back in January Mr Brabeck was hailing Matt Damon in a blog posting about him receiving the World Economic Forum (WEF) Crystal Award for water campaigning. You can bet that the award was not for campaigning against Nestlé’s appropriation of community water supplies. I’ve always liked Matt Damon as an actor and writer, but as a water campaigner he is a washout if he has traded exposing abuses by Nestlé for a fat advertising contract. How about supporting Americans and Canadians campaigning to protect their water supplies from Nestlé, Matt? See our Update 46 newsletter. There was also a protest outside the AGM organised by SUMOFUS about Nestlé impact on water in countries such as Pakistan. Thank you for supporting the campaign, Rosie. As our boycott successes page explains, the boycott has forced some changes in policies and practices and was instrumental in bringing in the marketing standards the World Health Assembly has adopted over the years. It also helps highlight the issue to the public, the media and policy makers. But Nestlé executives invest in countering the boycott instead of making required changes, so more pressure is needed. People can support the boycott and email Nestlé to let them know – resources on our Nestlé boycott page. The boycott is a parallel strategy to our work for legislation, which is what is really needed: better regulation. There are now 70 countries with laws in place. In countries such as India formula sales are static, while in countries such as China, without good regulations, there is aggressive marketing and exponential growth. In Brazil breastfeeding rates have recovered from the decline experienced when marketing was unrestricted. We are always looking for ways to increase the pressure so suggestions as to how to be ‘more radical’ would be appreciated. Please do contact us. Also spread the word and encourage others to support the campaign. There are resources to download from the boycott page and in our Virtual Shop. The new feature film Tigers, by Oscar-winning Director Danis Tanovic, which received its world premiere this month, is based on a former Nestlé salesman who exposed the company with the help of Baby Milk Action and IBFAN and is putting this issue back into the media spotlight. Sign up for screening dates on our special Tigers page at http://www.babymilkaction.org/tigers. There will be plenty of opportunities to involve more people in the campaign and increase the pressure on Nestlé when the film hits the cinemas.